The Experts in Slab Leak Detection and Inspection – Quality Services from Your Local Plumbing Company Is Just a Phone Call Away! At Glendale Expert Plumbing and Rooter, we realize that undetected water leaks can quickly lead to costly water bills, easily depleting your bank account. Not only can these leaks increase your utility bills, but they can wreak havoc on your structure. Getting control of the situation fast is the key to preventing expensive repairs. We are a fully licensed, specialized plumbing company providing leak detection services in Glendale, California by certified, independent contractors. From leak detection to line location, our customers know they can depend on us to always deliver top-quality, dependable service. Using innovative, non-invasive electronic leak detection technology, we keep messes to a minimum. Did you know that a small hole in a concrete slab, no bigger than the size of a ballpoint pen, can actually leak thousands of gallons of water a day? That is a massive amount of water that is leaking out of your home and adding to high utility costs. If you choose the wrong company to help you with this problem, you could end up with quite a costly mess on your hands. Homeowners that prefer not to have their concrete slab jack-hammered and their flooring ripped need to call us first. 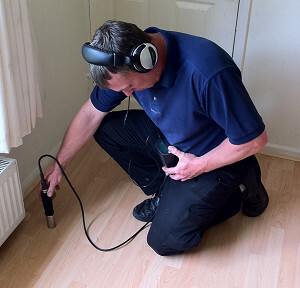 Our contractors use electronic equipment to find the precise location of the leak and concentrate repairs to that location. Not only does this manner of slab leak detection reduce mess, it makes repairs go faster than traditional slab repairs. Owning a pool is a dream of many California homeowners, but pools can present many problems, including unexpected leaks. If you have noticed your pool deck is sloppy and wet when the pool is not in use or your pool’s water level is continuously below normal, these are signs that there may be a leak someone. Give us a call and let us perform a qualified inspection. Our services eliminate the guesswork. Whether you need below ground inspection services, need your water heater repaired, or want to schedule maintenance services, you can depend on our team of contractors to provide you with professional and knowledgeable service 24/7.